To mark the 40th edition of Decorex International the organization brought together their friends – old and new – at Syon House to celebrate the past, present, and future of design. Decorex and the London Design Fair, the umbrella brand for Tent London and Super Brands London, will again be partnering this year London Design Festival. This collaboration between two complementary shows will see both present their exhibition consecutively. One ticket will be valid at both shows, which means visitors will be able to access two major destinations of London Design Fair. Boca do Lobo and Covet House are attending together on this incredible trade show from 17th to 20th September. You can visit them at Stand G41. 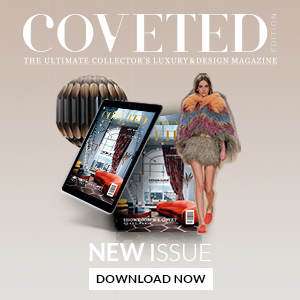 Boca do Lobo’s promise is taking all the visitors to a sophisticated design expedition through their own world – Covet House world. And they present two amazing pieces: The Pixel Cabinet and the Lapiaz Sideboard. The 1088 triangles that complete this piece carry the dedication and art of those who built it – with a diversity of finishes never seen before. The Lapiaz Sideboard originates from one of Boca do Lobo’s iconic design pieces. Based on the same aesthetic that created a legacy, the Lapiaz Sideboard takes exceptional craftsmanship and design to a new realm. Consisting of two individual modules, the Lapiaz is finished in polished stainless steel that portrays a perfect mirror, with a poplar root wood veneer interior. Don’t miss the chance to see these amazing pieces and save the Date!